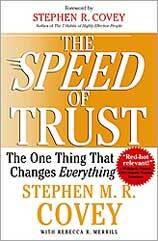 I was on Facebook the other day when I saw a friend’s post about a book by Stephen Covey on the speed of trust. Curious, I did a quick read on the topic. Though I didn’t dig much deeper than that, I have thought about the idea of the book since. How much does trust impact business? How do you build trust quickly? During the training of our franchisees we often discuss the fact that customers don’t buy from people they like, but from people they trust. If you can build trust quickly it usually leads to improved sales. The thing about trust is that it has to be authentic. In other words, if your only motivation for building trust is to improve sales you won’t be as successful at building trust. Everyone has a different level at which they are comfortable trusting others. I think we all know people who blindly trust everyone (some may call them gullible). This continues until they get burned, after which they learn to be more cautious about giving their trust so freely. Some become cynical, feeling as though everyone is out to get them, and trust no one. Somewhere in between there is a balance of letting others earn your trust while also awarding that trust and maintaining the belief in the overall good nature of people. So, in business, how important is trust? Can you even do business if you are not able to earn people’s trust or trust others? Having had a number of business partners to date, I argue that without trust you may as well not even bother starting a business with any partner. Trust forms the foundation of any strong business, partnership, employee or franchisee. Back to the question of how to build trust quickly. Here is a link to Covey’s book’s synopsis. I think it’s worth giving a read. Having not read this book beyond the abstract and a couple forum discussions, I make the following observation: Trust is likely the reason so many do business with close friends or family, where trust was earned outside of business and then extended to business dealings. What do you think? How do you earn trust, and how do you award it to those around you? What is the number one thing that builds trust in your relationships?